UPDATE 20160114: The links to the ESET ChallengeMe 2013 sample are now outdated. I have attached the samples to this post and you can get them here: Crackmes. Password: eset. Enjoy! I was introduced to ESET’s ChallengeMe 2013 by Yashar Mahmoudnia, a member of the Reverse Engineering Malware Research group on LinkedIn. You can download the challenge here. Before reading the solution, I wanted to try my hand at the challenge and brush up on my skills. Then I can compare my results to see how I did. I am half-way through the challenge and here is what I have learned so far. The table starts at address 0x40C074 and if you keep scrolling down to the end of the table, you will find that it ends at 0x40C150. The RVA of the table is C074 and if we subtract that from the C150 we get the size of the table: 0xDC (220 bytes). This is all the information we will need to use ImportRec. 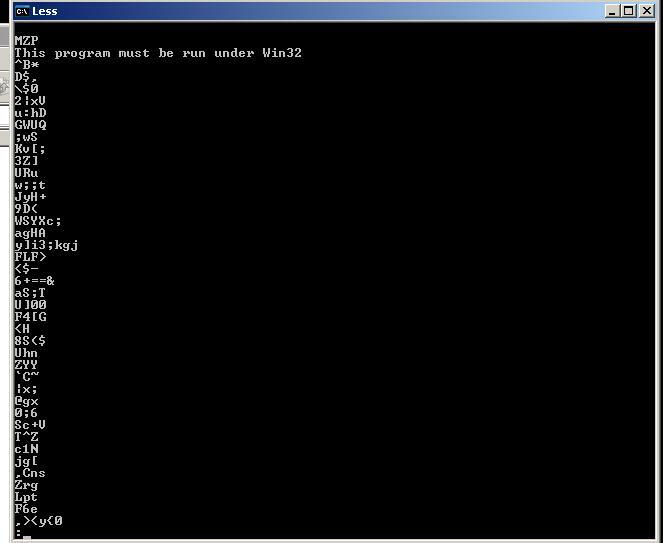 Attach to the running process with ImportRec, the right click the big middle, white box and go to “Advanced Commands”, then “Select Code Sections”, and accept the defaults. Now press the full dump button to dump the process from memory. Click “Ok” to close the dialog boxes. Click OK, then click Get Imports. The big middle white box should have no errors. 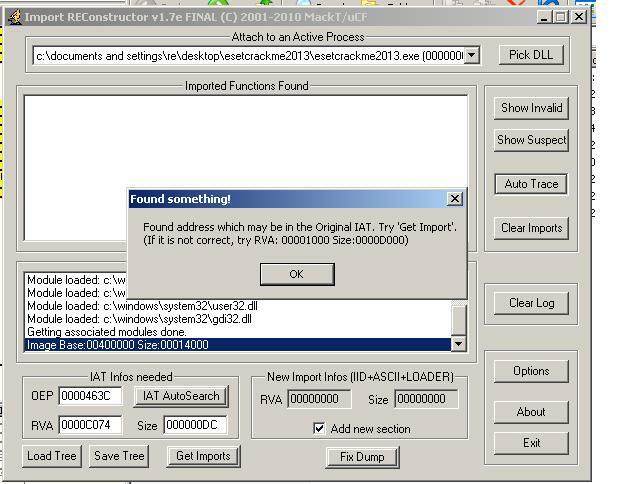 Next click on the Fix Dump button and click on the dump file that ImportRec created for us earlier. 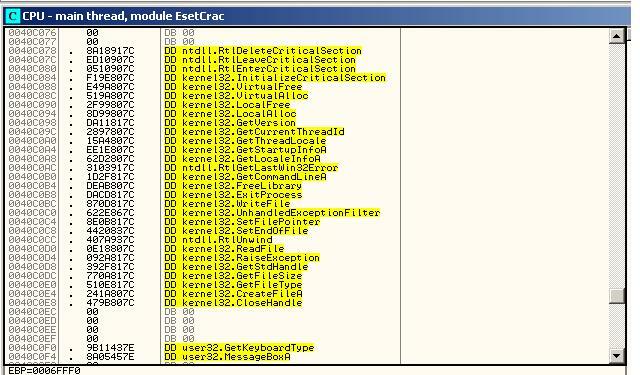 ImportRec will create a esetcrackme2013_dump_.exe file. You should be able to run that file and it should work just like the original packed sample, displaying the same start up message, and exiting when you hit the enter key. 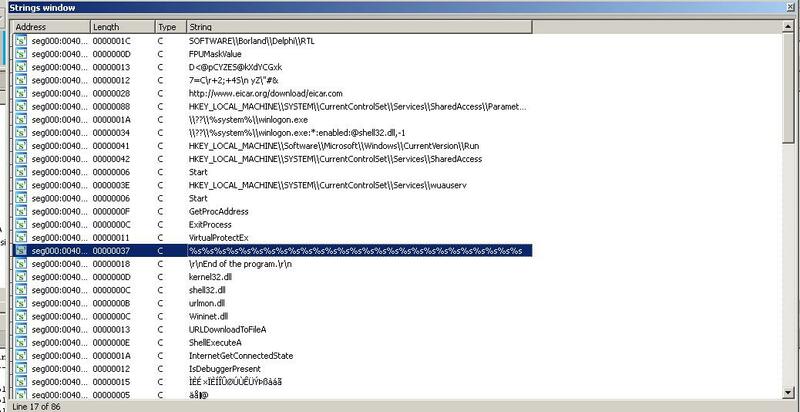 I see some Windows Registry key strings HKEY_LOCAL_MACHINE\\Software\\Microsoft\\Windows\\CurrentVersion\\Run, and HKEY_LOCAL_MACHINE\\SYSTEM\\CurrentControlSet\\Services\\SharedAccess. This sample may set these keys to persist between power cycles. There are strings to URLMON.DLL functions that check an Internet connection and to download a file. I see an URL to http://www.eicar.org, so this thing may be trying to download an eicar.com file. Also note the long string sequence highlighted in the string snapshot above. 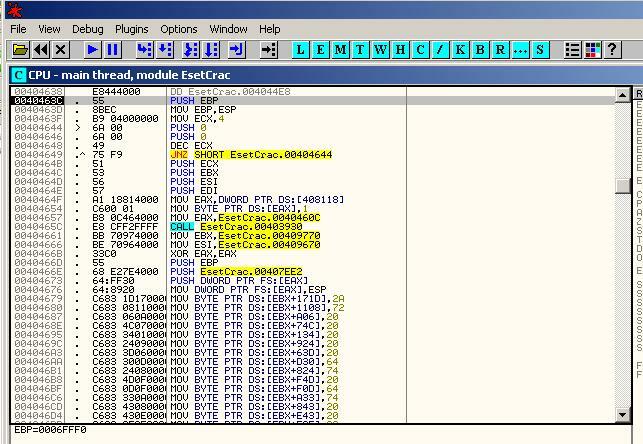 That looks like the string sequence used to leverage an old OllyDbg vulnerability. I see other possible anti-debugging strings such as GetTickCount, and IsDeguggerPresent. Upon first impression, it looks like this program might be some sort of downloader or dropper, but the only way to know for sure is to attempt to debug it. See if we can coax the thing to continue even after we hit the enter key in order to observe what its true intent is. I will write up those results and post them in a few days. EDIT TO ADD 20140109: Yashar posted his teammate’s write up of the solution. EDIT TO CORRECT 20140109: Corrected the spelling of Yashar’s name. I can’t join it. Is there anybody having identical RSS issues?